Written and illuminated in Siena, and painted in beautifully saturated colours, this Italian Book of Hours features an artist with a lively feeling for humour rather than mere sober devotion. 140 x 95 mm. – 182 leaves, with 12 historiated initials and border decoration including medallions. This is a colourful and decorative Italian Book of Hours with twelve illuminated pages with historiated initials and full border decoration, five of which with burnished gold grounds on all borders. The text pages too are liberally furnished with golden initials, rubrics and flourish borders, with birds and other anomals. The illumination is recently attributed to the Sienese illuminator Bernardino Cignoni (c. 1448-1496). He had a most prosperous career working for various of the Sienese public institutions, beginning with commissions for the cathedral of Siena. In many of his projects on large format choir books he is known to have collaborated with famous contemporaries. Although he learned from them and took their models, throughout his career he continued to follow his own, somewhat angular style. Much of his oeuvre is still preserved in Siena – among which are large format choir books and also two smaller manuscripts. Another Book of Hours is now in New York (Morgan Library and Museum, ms. M. 311). The present Hours likely was made for a member of one of Siena’s religious institutions, making it into an even more interesting socio-cultural document. Bernadino was a popular artist who became a wealthy citizen of Siena where he played an active role in the city’s public and religious life. An enigma is the figure depicted in a pen-drawing in gold with a rosary and praying before the Arma Christi (lower margin, f. 46v), could she refer to Catharina of Siena (before her canonization in 1461) or to another of the Mantellate? 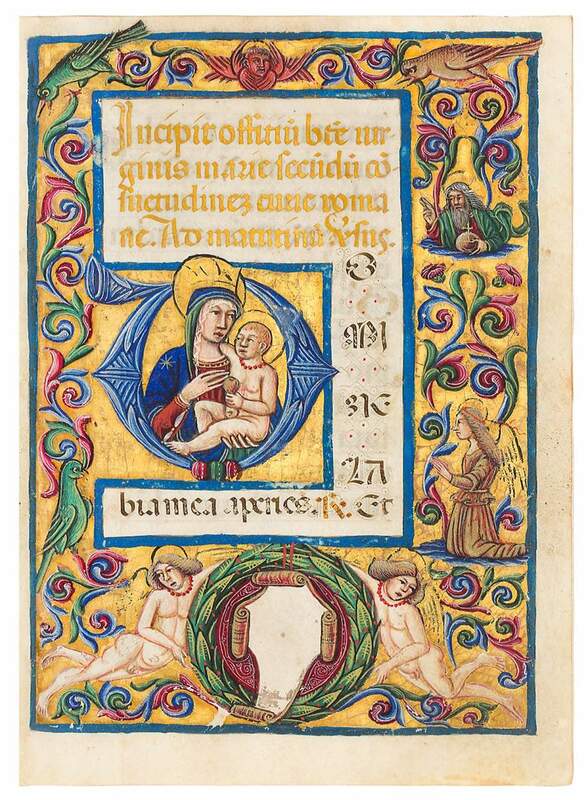 Italian Books of Hours deserve much more attention, as they are testimonial to the spiritual atmosphere of the Italian public as well as being small treasures of artistic accomplishment on its own. Today the manuscript is called after a later owner: the Earl of Mountnorris. The Irish peer Arthur Annesley (1744-1816) succeeded to the titles of his father (1761), but when this was declared invalid (1771), he was created 1st Earl of Mountnorris in 1793.